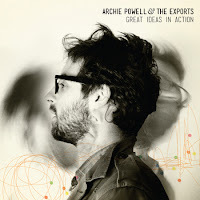 Archie Powell & the Exports are back! Well, they didn't actually go anywhere, but it has been a little while since they've given us new music. If 2010's Skip Work made you rightfully think of them as one of Chicago's most likeable and straight-up rocking bands, you'll be glad to know that a new set titled Great Ideas in Action is set to come out on May 1st. You might be even happier to know that you can download the first track, "Metronome," for free right now. It's a hook-filled, guitar-driven tune that's set off with cynical observations about the world while keeping an underlying sense of humor. In other words, it sounds very much like AP&TE. You can either get it from Bandcamp or in exchange for a tweet. The album will feature 11 tracks: Metronome, Crazy Pills, Shooting Spree, Bend Over Backwards, I Need Supervision, You Might be Cruel (Or I Might Be Dumb), Job Fair, All the Same, Sticky Buttons, Great Ideas in Action, Only So Much You Can Do. In other news with the band, they'll be heading south next month to play SXSW, but before that have a hometown show scheduled for Saturday, March 3rd at Township (formerly Panchos). Also, if you missed it last week be sure to check out how AP&TE recently took advantage of Kickstarter to accomplish something truly momentous. Awesome news, loving the new track and really can't wait for the album to drop now!